HTC is surely struggling to make profit, but it won’t affect their ability to develop quality device. 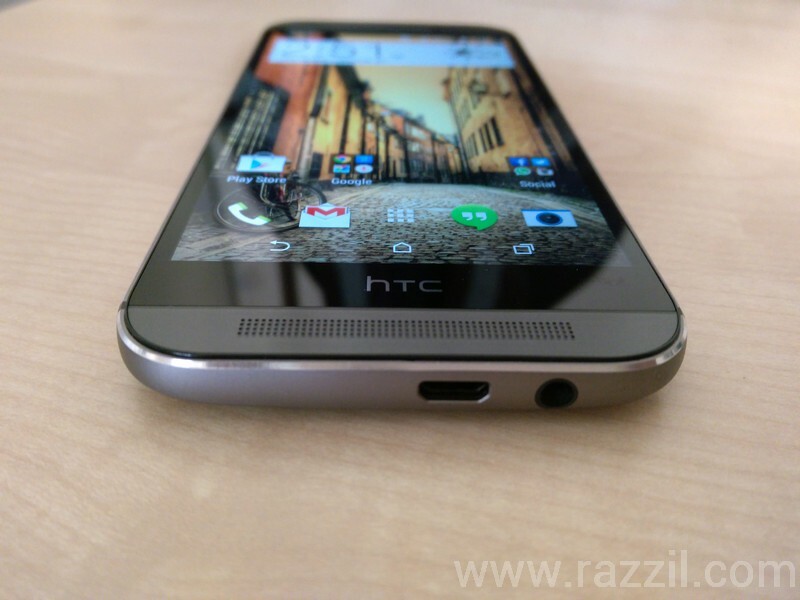 After the huge success of HTC One (M7), they come up with successor of One called HTC One (M8). 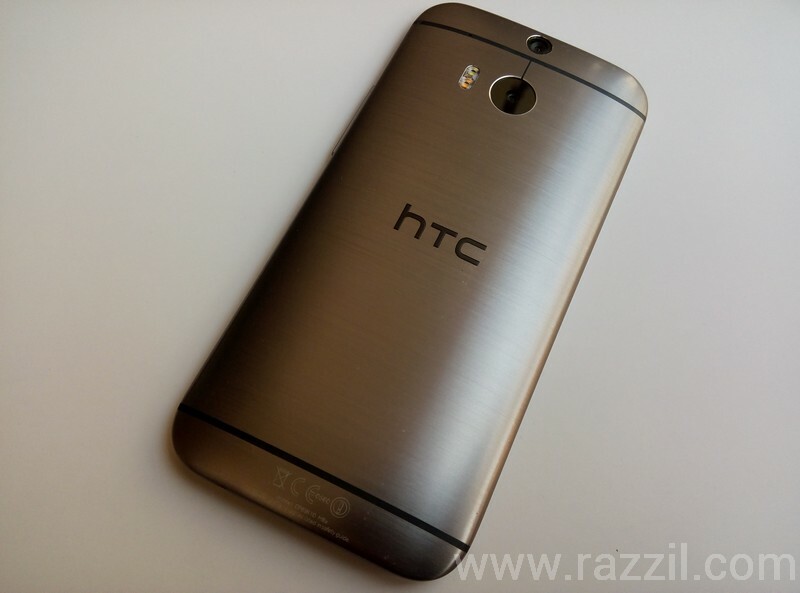 HTC One (M8) is fully wrap-around, high quality, all-metal design unibody with curved edges. Last year’s hero, HTC One M7 not only bring all-metal unibody frame, but also some interesting innovation in the mobile industry like dual front-facing BoomSound speakers and UltraPixel camera. This year HTC took the innovation to new heights. I’ll discuss those features in the upcoming paragraphs. My review is based on 1 month of use with the M8. Here is my detailed review, One thing I like to tell you that 4G LTE is not available in India so my review is based on 2G or 3G. When in comes to Design, HTC always manages to impress with its phone design. 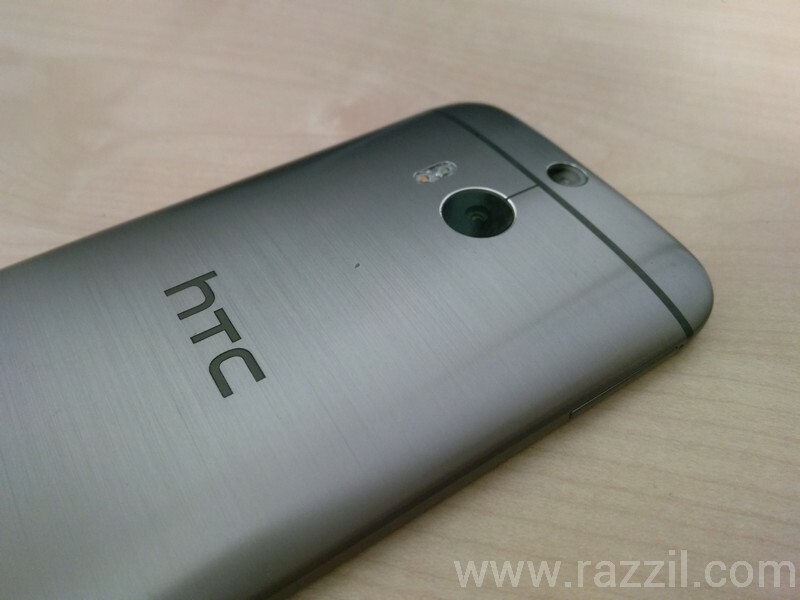 Last year HTC One M7 was beautiful and won many hearts, With M8 they improved the design. Last year’s HTC One M7 features 70 percent metal and now M8 has 90% metal. You’ll see the curves at the back which fits in your hand and make it easy to hold. I’m using Gunmetal Gray version which looks fantastic and looks much better than its competitor. 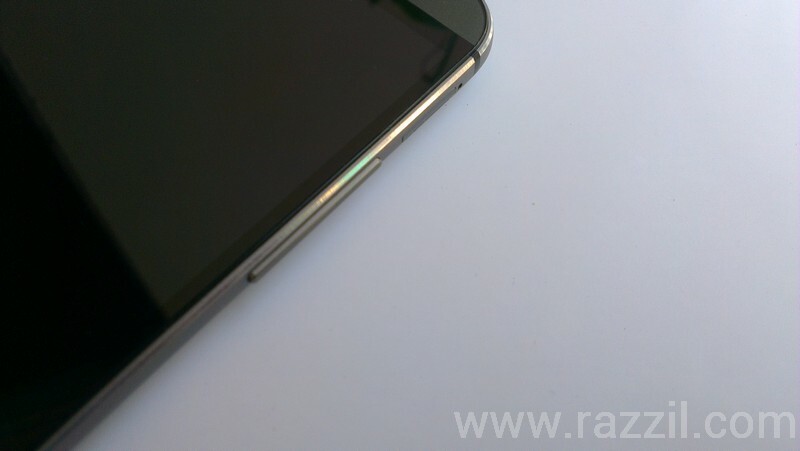 On the bottom of the phone you’ll find MicroUSB and 3.5 mm audio port. 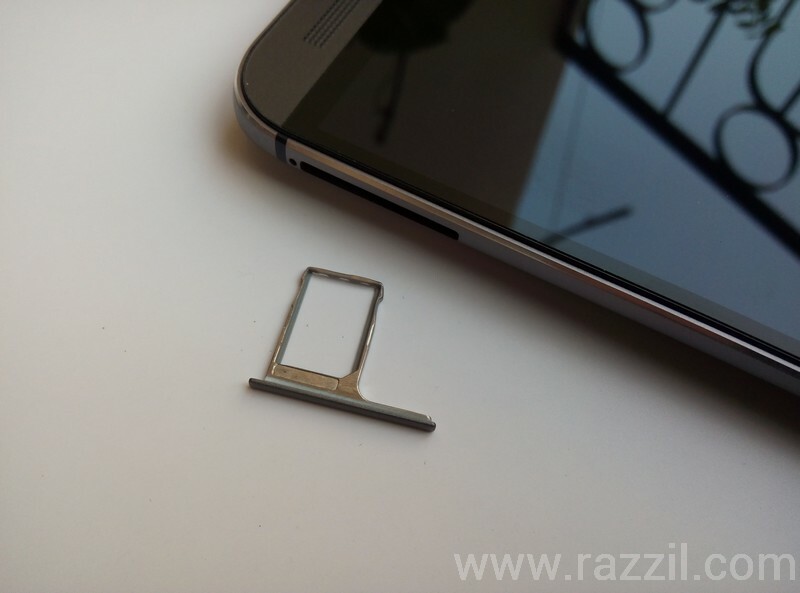 On the left side of the phone, there is a Nano SIM slot, If you’ve Micro SIM or regular SIM then you’ve to cut it into Nano SIM. The USB tray ejector is there in the box. On the right hand side, there is a MicroSD card slot and volume button. HTC One M8 support up to 128GB of MicroSD card and again you’ve to use a USB tray ejector. On top, there is a power button and also the IR blaster. The placement of the power button is a bit awkward and it’s difficult to reach that button. Back of the phone you’ll find the htc logo and duo camera with dual LED flash. We’ll talk later about HTC One M8 Duo Camera with UltraPixel technology. On the front side, you’ll find dual BoomSound stereo speakers, front camera and the htc logo. 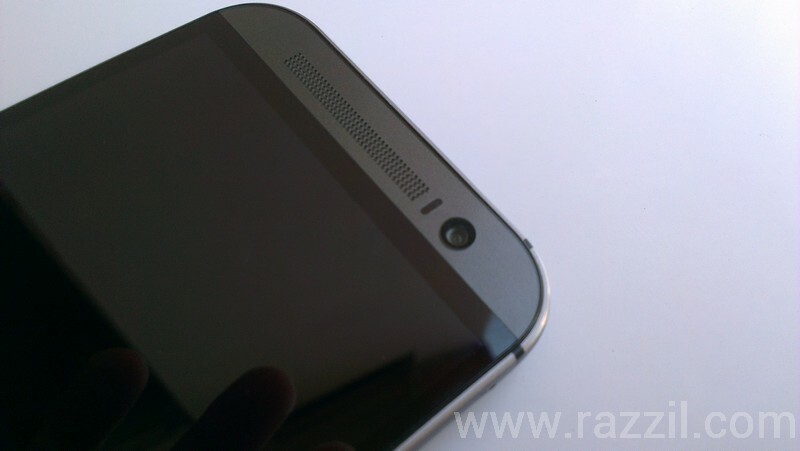 Unlike the M7, there is no hardware button on the M8. Instead, there is on-screen button. The bezel will surely feels you off, but HTC said there is some kind of circuit behind that bezels. 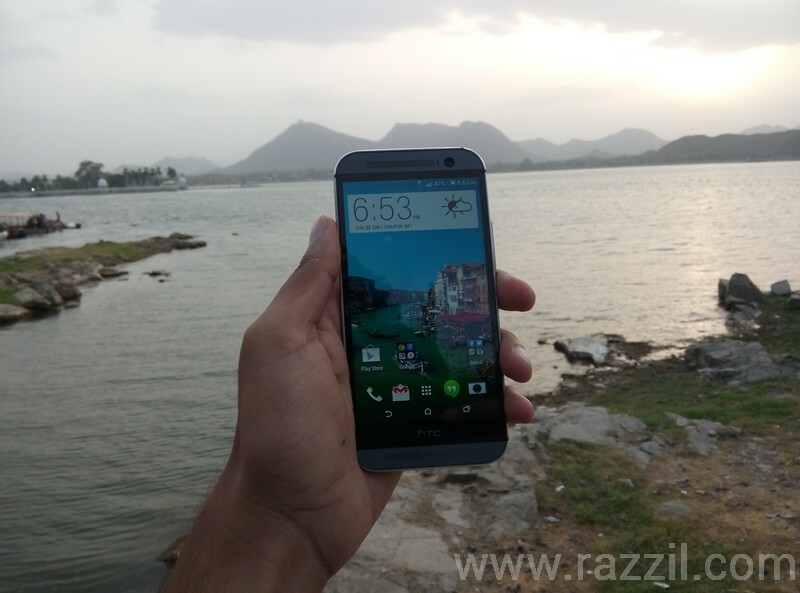 HTC One (M8) is beautifully from outside and monster from inside. The M8 is powered by 2.3 GHz Qualcomm Snapdragon 801 Quad-core processor, which is mated with 2GB of RAM. With Qualcomm Snapdragon 801, the M8 is not only powerful in performance, but also easy on the battery and it also features QuickCharge 2.0 which will speed up the charging process. 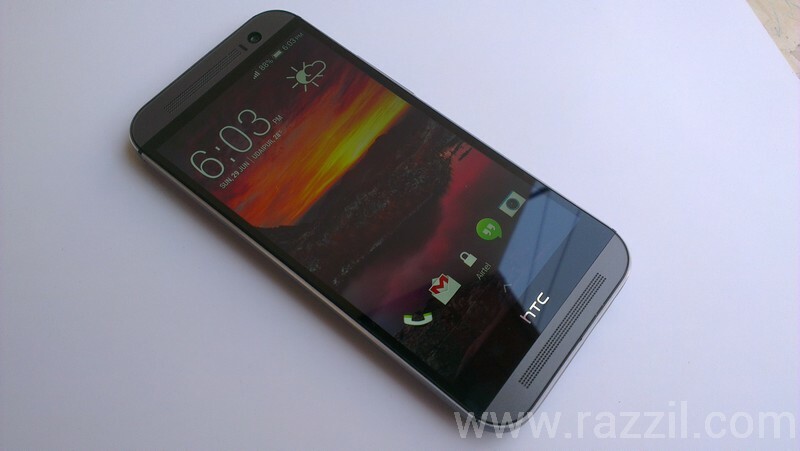 HTC One M8 has a 5-inch Full HD Super LCD3 display with the resolution of 1080×1920 pixels. The Display is gorgeous and every detail looks crispy and color production is quite good. The screen is visible even in direct sunlight. 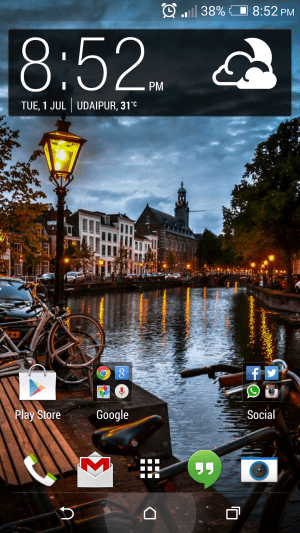 HTC One M8 comes with Android 4.4.2 KitKat which is further customized in HTC Sense 6.0. HTC include some nice visual enhancement as well as helpful features such as BlinkFeed, Motion launch, new HTC Sense TV. I’m always the fan of Sense UI and best when you compare with other UI from different OEM. In Sense 6, HTC made lockscreen slightly simpler, in the previous version you’ve to drag the clock to unlock the screen, now there is simple lock icon along with 4 app icons. For some reason, HTC doesn’t support widgets on the lockscreen. By default on homescreen, the M8 has 3 pane home screen where the left one is BlinkFeed which is the default. You can remove the BlinkFeed if you want. Homescreen animation is smooth when navigating from one pane to another. Long press on homescreen will bring the window where you can choose the option from three different options Choose wallpaper, Add apps and widgets and manage home screen panels. Manage home screen panels is the option where you can remove the BlinkFeed. App Drawer is the one thing I don’t like in Sense 6. 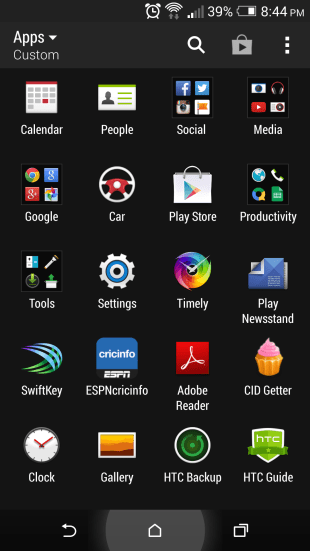 HTC opts for an opaque app drawer with black color in the background. The apps are arranged in a 4 x 5 grid size and you can change it to 3 x 4 from app drawer settings. You’ve to scroll vertically to go through the apps list. Apps can be arrange in Custom, Alphabetical or Most recent. 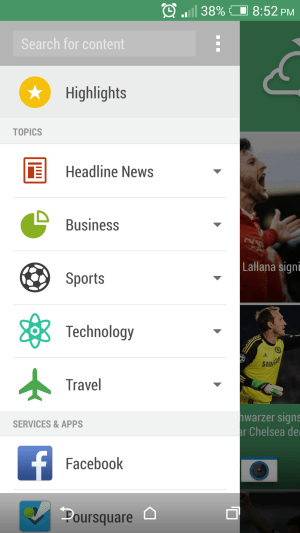 HTC improves the BlinkFeed, now it’s no more content aggregator. BlinkFeed is now more intelligent in Sense 6. BlinkFeed will bring restaurant recommendations from Foursquare and I also noticed that when I was searching restaurant on Foursquare app, at that time BlinkFeed automatically bring nearby restaurant feeds. Another useful feature of Sense 6 is Motion Launch gestures. With Motion launch, you can unlock your phone, access homescreen and launch apps with the help of gestures. HTC using built-in motion sensors to detect when you pick up the phone or when the phone is in landscape orientation. When the screen is off, hold your phone in landscape orientation, then press the volume button to launch the camera app. Last year M7, the sense TV is just used as remote where you can change channels or switch on/off the tv. With M8, HTC rebuilt the app from the ground to make Sense TV a complete TV guide. Along with remote, HTC Sense TV now include program guide, social feeds and live sports stats. Configuring the Sense TV is hell lot easy and during the setup you can add television, cable box and sound system. 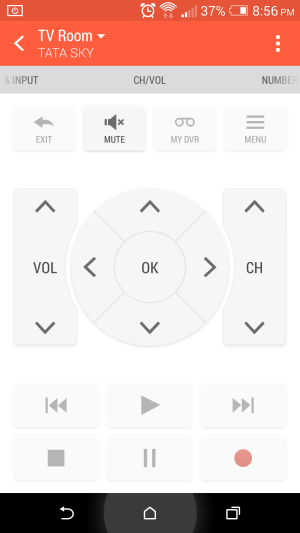 The Sense TV also combines your TV remote and settop box remote into one single remote. 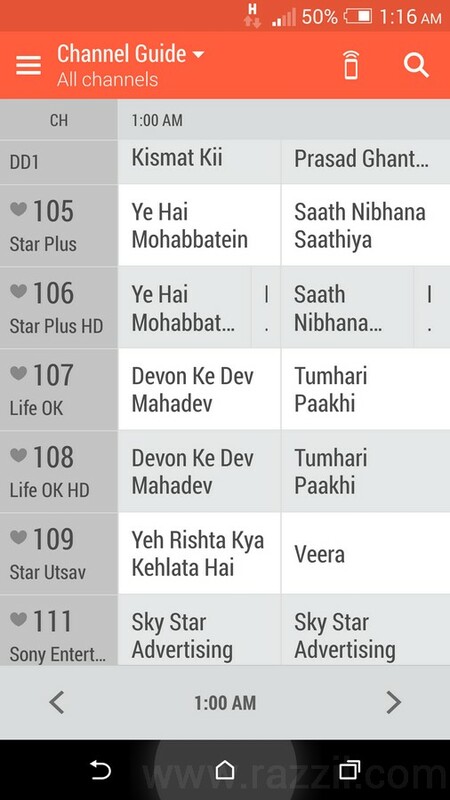 HTC also includes Program guide from this you can check which program is coming on, which channel, you can add the channels in your favourite list and htc also recommend the channels based on your activity. Along with this, you can see official facebook, twitter pages and popular hash tags related to shows. Sense TV also lets you see scores and stats from within the app. You get live scores and stats for the biggest sports and professional leagues around the word. HTC also improves the notification bar. Now when power saver is ON, it’ll no longer display on notification bar which looks annoy in previous version of sense. You can access the quick settings by pulling down notification bar and press the top right icon or you can pull down the notification bar with 2 fingers. You’ll find many settings which you can quickly toggle the states without going to deep inside the settings. You can also customize, re-order the quick setting to meet your preferences. Do Not Distrub mode will block incoming calls, sounds and notifications. This is the only feature you’ll not find on any other smartphones. HTC BoomSound is the front facing stereo speakers with software enhancement. HTC One (M8) features mult-band amplifier which controls volume and sound quality. The system boosts bass while keeping the mid/high frequencies clear. The software also balances the vocal and sound details so that you get pleasant sound experience from BoomSound. The Redesigned speaker chambers will give 25% louder sound that it’s predecessor. Last year HTC came up with UltraPixel technology, which focus on lens size instead of focusing on pixels. This year, HTC includes one more camera lens with UltraPixel technology. HTC One M8 feature duo camera, the first lens is UltraPixel which is same in M7 and second one will capture the depth of field information. Before moving into quality of the camera, first we’ll talk about camera app. HTC One M8 camera app is very much improved one than M7. The new camera app features Shutter button, Gallery button, Menu button, flash on/off button and number of remaining photos that can be stored in the phone memory. 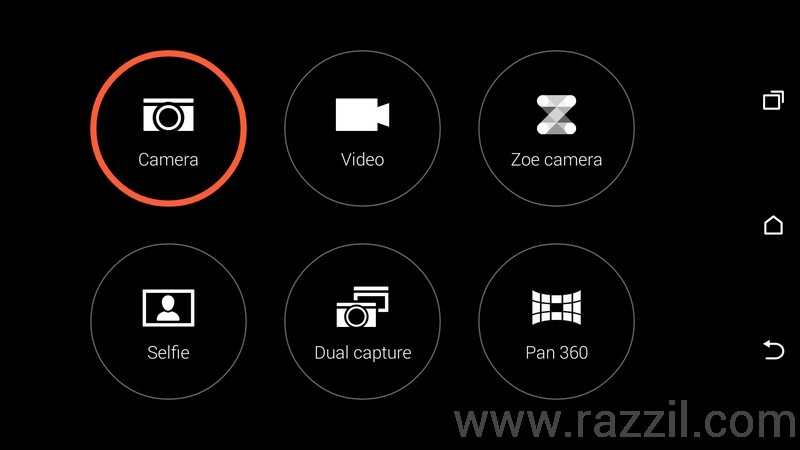 By tapping on four circle button, it’ll take you to the screen where you’ll find the shortcuts of different camera mode such as dual capture (which uses both cameras to combine multiple shots into one), selfie shots (this one for front camera), pan 360 (which create 360 photosphere), video mode and Zoe camera. This is an easy way to choose between your favorite mode. More camera modes also available on menu options (three dot) where you can find other Manual, Text, Macro, Night, Panorama etc. The first features of Duo camera that capture everyone’s attention is Ufocus. 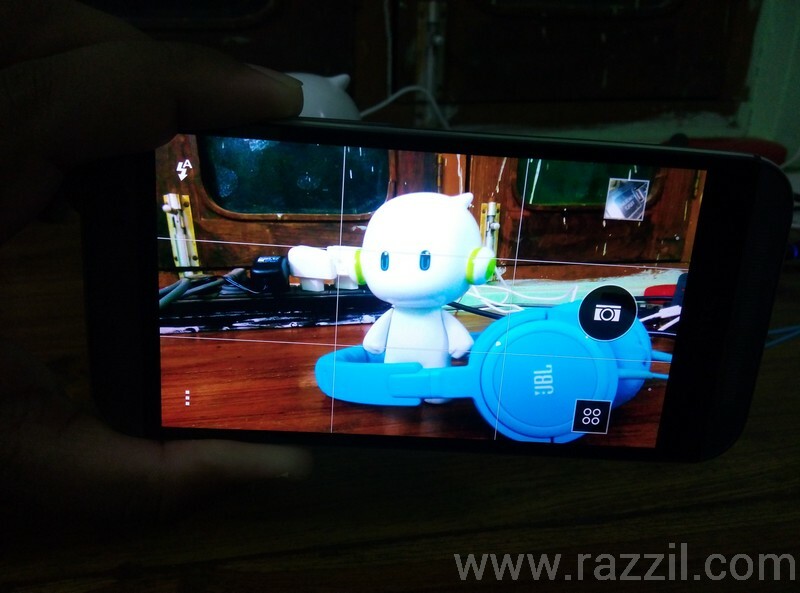 The ufocus is using depth of field information that capture from Duo camera and uses that information to create professionally looking blurred background or bokeh effect. In this you can blur the background and focus only on the main subject. The Good thing is that you don’t have to worry about the focus at the time of capture, you can do this later from the gallery edit section. In this you can see the photos from different angles by tilting the device. Add different animated seasonal theme on any photo such as snowflakes, dandelion seeds, autumn leaves and snowflakes. When you’re going to apply the season effect, it’ll change the color temperature of the photo to match the season. This mode is designed to emphasize the subject in a photo by de-saturating the image, separating colors, and adding other effects like motion blur. Duo camera comes with twin LED Smart Flash. The system is designed to improve the quality of the photos. Normally flash ruined the photos with unnatural colors and red eyes. The smart flash system takes care of all the factors such as authentic colors and accurate skin tones. HTC finally did Photosphere on its device. This feature was available for LG, Sony and Nexus lineup only. M8 Pan360 UI is very simple among all and sticking photos bringing great results. On many blogs you’ll find that people are criticizing UltraPixel because of low pixels. But I’ve a different opinion, yes in some department low pixel really lacking, but most of the time it’ll deliver perfect picture. During my test, I’ve found that UltraPixel is quite good, especially in low lights, forecast conditions and landscape scenery. Yes the phone slightly lacks in direct sunlight, but you can correct the picture by using manual mode. 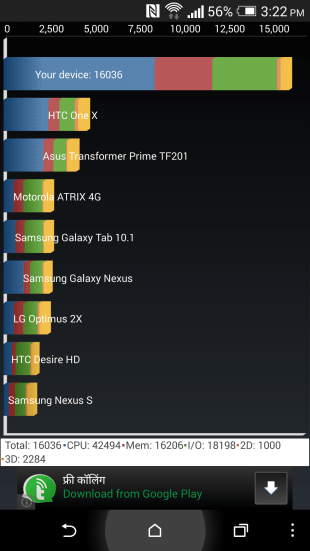 The camera performance is very fast all thanks to HTC ImageChip 2. Note: I test the device mostly with 3G and Wi-Fi. Battery Life may be vary from user to user, location to location and apps. HTC One M8 is equipped with 2600 mAh Embedded Li-Pol battery. The capacity may not look decent for you, but 2600 mAh Battery, Snapdragon 801 and Sense 6 mixtures give the impressive battery life. 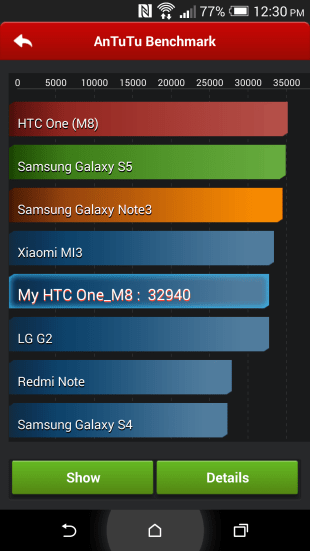 HTC claims that M8 give 40% longer than its predecessor. To keep your juice for longer time, HTC introduces Extreme Power Saving Mode which gives you up to 2 weeks of standby time. In this mode, HTC disabled all the smart features from Smartphones and turn into a basic feature where you can manual access to calls, emails, texts and other basic functions. With full charge HTC One M8 battery takes me to 18 hours with 3G always ON, Wi-Fi ON for peak hours, few calls, 7-8 shots from the camera and then applying some effects and share it to social networking sites. With semi-moderate use, the battery will takes you to 1.5 days where I put the phone on power saving mode (here we’re talking about normal power saver mode, i enable extreme power saving mode only when phone battery reaches to 14%) when phone battery reached 35%. 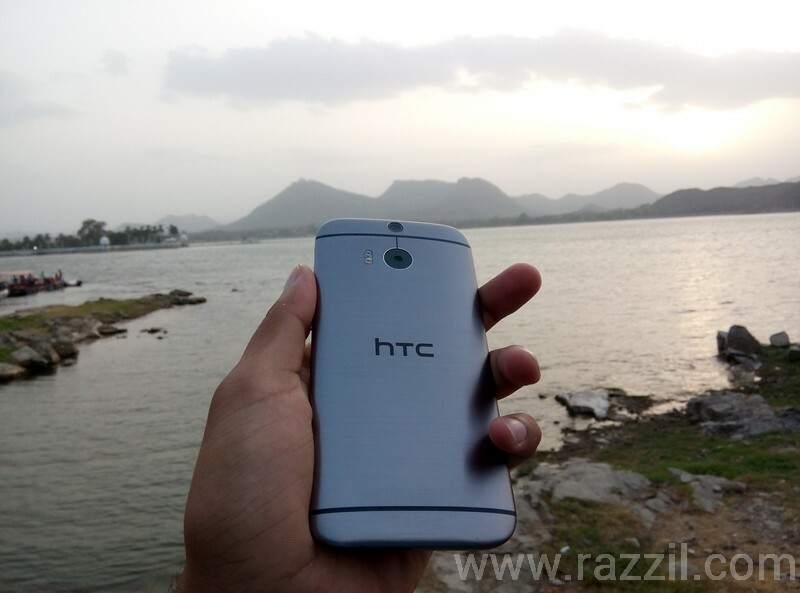 HTC One (M8) is a beautiful device from both inside and outside. This is the perfect phone for anyone who is looking premium phone with a good camera, battery life and premium support. HTC already announced that the M8 will get Android L updated within 90 days after Google release code.